This band are hailing from Stockholm, yes the capital of Sweden and liken themselves to Echo and the Bunnymen, The National and U2. They’ve been together since glorious summer of 2011, shortly after Carl and Johan (the guitarists) met at Muse concert, an extraordinary way to start a band, especially if you’ve just met the person. In the band you have, Carl Vikberg – vocals and guitar,Johan Melander – guitars, Viktor Åström – bass guitar and Björn Rudling – drums. Since being together they’ve been creating and developing their sound, which is astounding when you first listen to it. 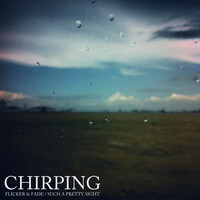 Flicker and Fade was released 10th February 2013 and is there third piece of music they’ve released after their first single ‘Birdland’ their debut EP ‘The Sirens. The fresh, fast paced and catchy guitar riff and the immediate start of the song draws you in quickly and it simply doesn’t let you go until the song has finished, and even then, you’re left wanting more. There’s definite comparisons from Echo and the Bunnymen, especially from the vocals , as Carl distinctively reminds me of Ian Mcculloch in his glory years being the 80’s. Sometimes bands that attempt this genre of music can come off quite badly, and sound pretentious but it’s not the case with this band as it sounds extremely genuine. A small breakdown within the song breaks it up nicely, but yet again keeping drawn in with some eerie whispering to keep you connected with it. The song is a definite crowd pleaser as once you’ve finished listening to it, it’s left ringing in your ear like fire alarm, but much more pleasant. However the single doesn’t stop there as if offers yet another piece of beautiful music which sounds heavenly, and something you’d only expect from a band that had been touring around countries, yet these lads only need a year and a half. Once again with the Mr.Sheen vocals and angel like harmonies the song brags bliss and beauty all at the same time. The single is a real treat for all decent music lovers out there, and for a band that has only been around for such a miniscule amount of time they can proud of their catalog so far.